Spanish for "crown", Coronado is home to the iconic Hotel Del. This historic hotel is Coronado's glittering jewel and most famous landmark of Coronado Island. Commonly referred to as an Island, Coronado is in fact a peninsula connected to the mainland by a strip of land called Silver Strand. Overlooking the Pacific and one of the state's most scenic beaches, Hotel Del is a world-class resort and a good place to start your "Island" experience. Coronado, CA – It’s lovely weather for a Surrey ride together with you! 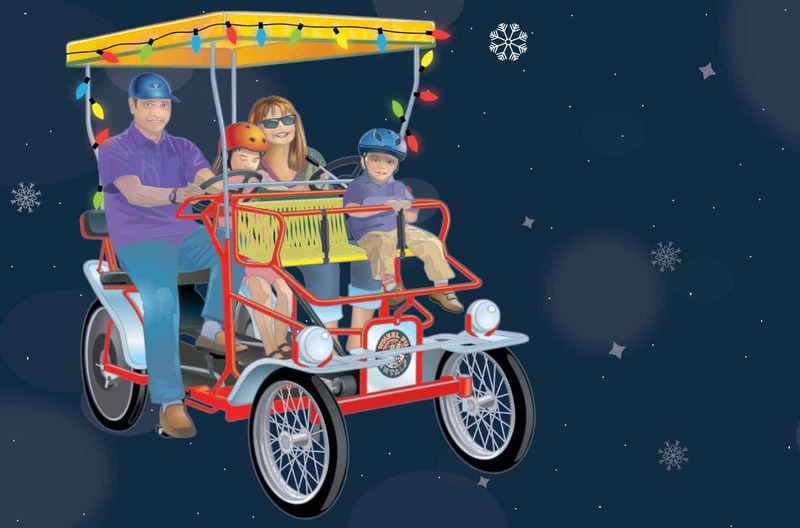 Just in time to usher in the holiday season, Wheel Fun Rentals is delighted to bring back its popular Surrey Sleigh Ride Guided Holiday Light Tours running from Friday, December 14, 2018, through Sunday, January 6, 2019. Starting at San Diego’s beautiful Hotel Del Coronado on Coronado Island, the guided holiday themed ride takes visitors through local neighborhoods that are glowing with holiday cheer and light displays! Wheel Fun Rentals’ flagship four-wheel Surrey bikes will be decorated for the occasion and lit with LED lights. Kids can play an engaging game of “I Spy Bingo” while knowledgeable tour guides delight guests of all ages with information about the local and historic landmarks, and see all the interesting sights that make Coronado Island so unique and majestic. Wheel Fun Rentals’ Surrey Sleigh Rides depart daily at 6 pm from PeDels by Wheel Fun Rentals at the Hotel Del Coronado at 1500 Orange Ave., Coronado, California 92118 starting Friday, December 14, 2018, through Sunday, January 6, 2019. Advanced reservations are required, for more information and to book your tickets, visit www.wheelfunrentals.com/surreysleighrides. Founded in 1987, Wheel Fun Rentals started with four wheel Surrey cycles, evolved into specialty bike rentals and bike tours, and now offers recreational rentals of all kinds from more than 100 outlets in 16 states. Specializing in unique bikes and tours, Wheel Fun Rentals has been offering clean, healthy family fun and affordable outdoor entertainment to nearly 3 million customers annually from city and state parks, resorts, and retail outlets through corporate locations and franchised territories. For more information about Wheel Fun Rentals please visit www.wheelfunrentals.com or call 805-650-7770. Follow Wheel Fun Rentals: @WheelFunRentalsOfficial on Facebook, @WheelFunRentalsOfficial on Instagram, and @WheelFunRentals on Twitter.